Nearly every day in our offices we discuss basis differentials and basis risk, yet it's a topic that is often neglected by many companies engaged in energy price risk management. What is basis? In simple terms, it's the difference between the price of an energy commodity in one market and the price of an energy commodity in different market. That being said, the different “market” can be a different location, also known as locational basis (i.e. US Gulf Coast ultra-low sulfur diesel vs. New York Harbor ultra-low sulfur diesel), a different product or quality which we can be referred to as product or quality basis (i.e. Singapore gasoil vs. Singapore jet fuel) or a different tenor or time frame (i.e. November NYMEX WTI crude oil futures vs. a November NYMEX WTI calendar swap), which we refer to as "calendar basis". Why is understanding basis, and basis risk, a key factor in energy price risk management? Let's explore a few examples. Locational basis risk is the risk that you encounter when you hedge with a contract that doesn't have the same or similar delivery point as the risk you are seeking to hedge. As an example, if a US Gulf Coast oil producer decides to hedge their crude oil price risk with NYMEX WTI futures (which are deliverable in Cushing, Oklahoma), the producer is exposed to the locational basis risk between Cushing and their local market price (i.e. LLS – light Louisiana sweet). To quantify this example, the August NYMEX WTI crude oil swap closed yesterday at $46.61 while the August LLS crude oil basis swap (LLS-WTI) closed yesterday at $1.54 which means that the forward market for August LLS swaps is trading at a $1.54 premium to August WTI swaps. In a future post we will explain how this Gulf Coast producer can mitigate their exposure to locational basis risk with basis swaps and other hedging strategies. Product or quality basis risk is the risk that you encounter when you hedge with a contract that isn't the same product or quality as the product that you are seeking to hedge. As an example, jet fuel is often hedged with crude oil, gasoil or ultra-low sulfur diesel fuel (and formerly, heating oil, until the contract transitioned to ultra-low sulfur diesel) as the futures and over-the-counter markets for crude oil, gasoil and ULSD futures, swaps and options are much more liquid than the market for jet fuel swaps and options. While jet fuel, gasoil and ULSD are similar (all are middle distillate fuels) and highly correlated they are not one in the same. As a result, if one chooses to hedge jet fuel with crude oil, gasoil, ULSD or another product, they are often exposing themselves to significant product or quality basis risk, not to mention locational basis risk. That being said, many companies are of the opinion that taking on product or quality basis risk is a much better alternative to not hedging at all, an issue we will also address in a future post. 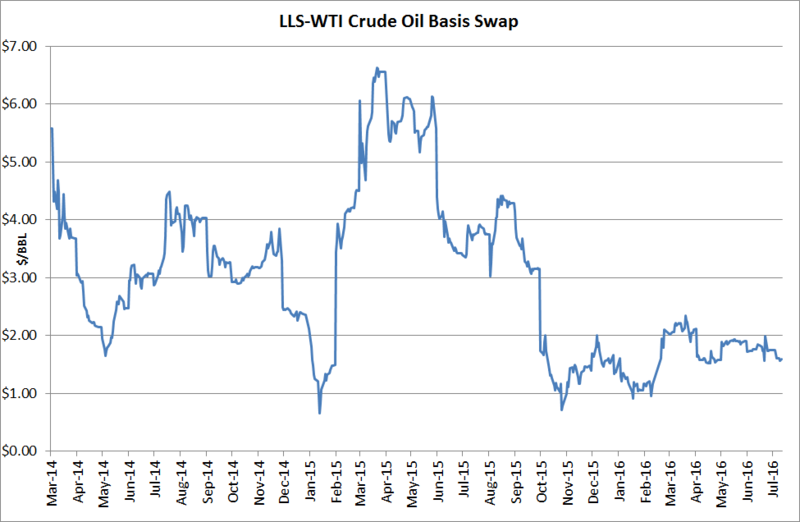 Like the previous crude oil basis risk example, jet fuel basis risk can also be hedged via basis swaps and other hedging strategies. Calendar basis risk, also known as calendar spread risk, is the risk that arises from hedging with a contract that doesn't expire, settle or mature on the same date as the underlying exposure. As an example, a large consumer (i.e. a vehicle fleet) of gasoline might decide to hedge their exposure to gasoline price by purchasing NYMEX RBOB gasoline futures. In this example, the consumer is exposed to calendar basis risk as NYMEX gasoline futures expire on the last day of the month prior to the delivery month i.e. the August RBOB gasoline futures contract expired on July 29, the last trading day of the month. While many might assume that this consumer has no choice but to to accept the basis risk this is not the case. There are other, actively traded products which will allow them to mitigate their exposure to calendar basis risk. As an example, in the OTC crude oil and refined product financial derivatives (paper) market (including gasoline), there are swaps and options that settle against the calendar month average of the prompt futures contract, an instrument which is clearly advantageous to the gasoline consumer when compared to the futures contract itself as they are consuming gasoline on a daily basis, not just the last trading day of the month. More specifically, if this gasoline consumer were to have hedged their July gasoline price risk with a July NYMEX RBOB gasoline (calendar month average) swap, the swap would settle against the average settlement price of the prompt futures contract for each business day during July, which in this case would be the August RBOB gasoline futures contract. While this post is a mere introduction to energy basis and basis risk, if you have any specific questions regarding basis, basis risk and/or basis hedging please feel free to contact us and we can address your specific needs. Editor's Note: The post was originally published in October 2013 but has recently been updated so that it is more current and comprehensive.